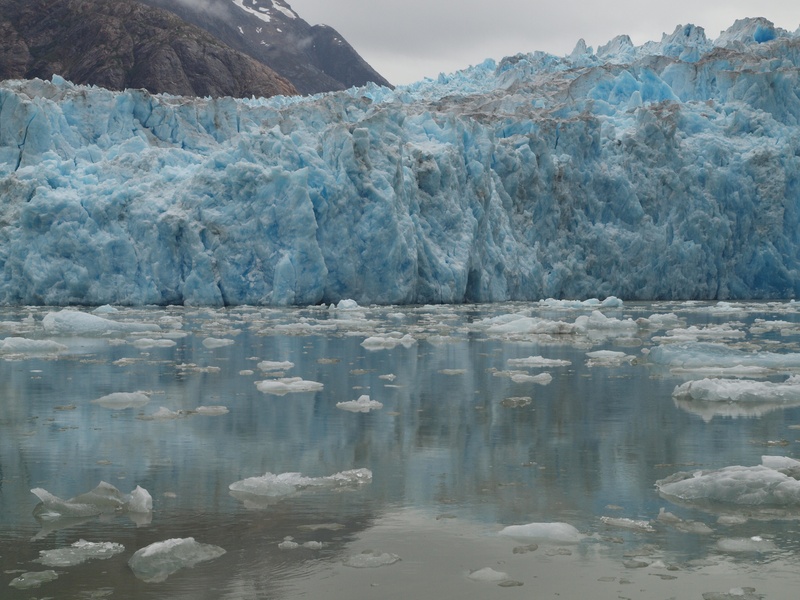 The Mendenhall Glacier was just a few minutes out of Juneau. 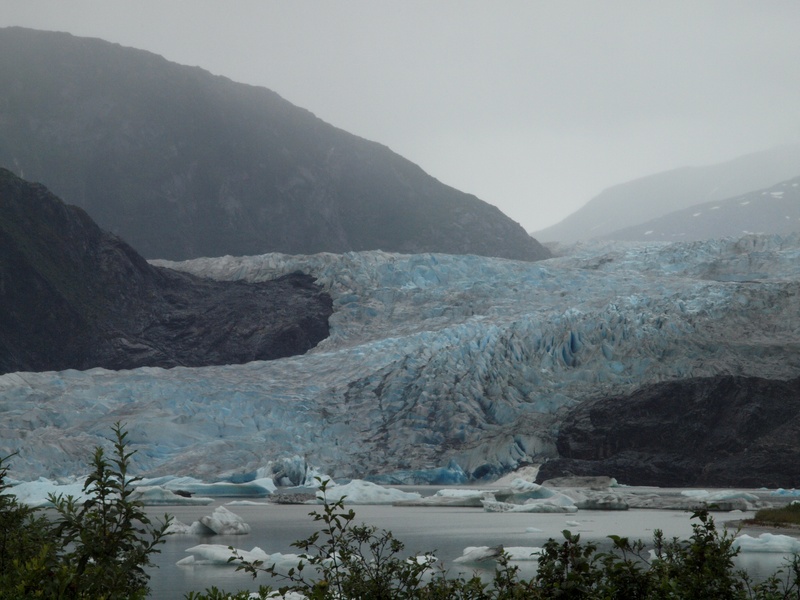 Juneau is a beautiful place with green forests, blue sea, turquoise glaciers, big red salmon and black bears. 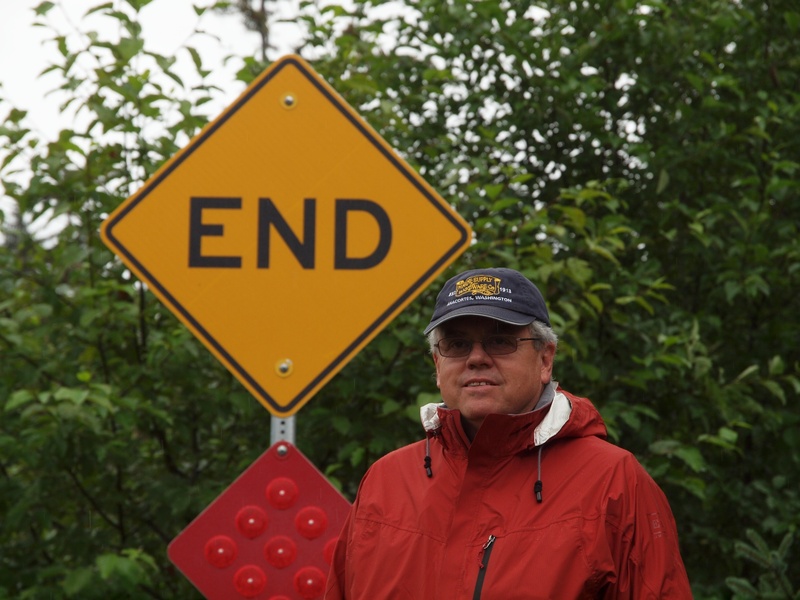 Because the history in this town had more to do with gold mining than Alaska natives and we didn’t have any specific contacts there and we rented a car, we took the week to explore the natural glories all around us. One thing though, it rained the whole week. It rained day and night. It rained so much that the rivers running off the glaciers were gray and silty and the backyard of our B & B flooded. It rained so much we had to wear rain pants to walk around town because you got splashed every time a bus went by. It rained so much that we half-expected to wake up and see the Ark floating by our second story window. 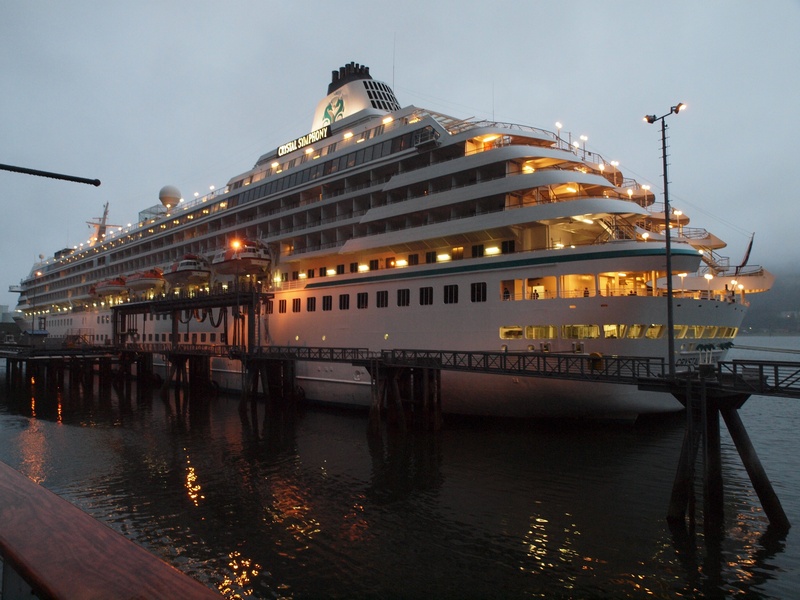 Jana’s cruise liner, Crystal Symphony, in Juneau. 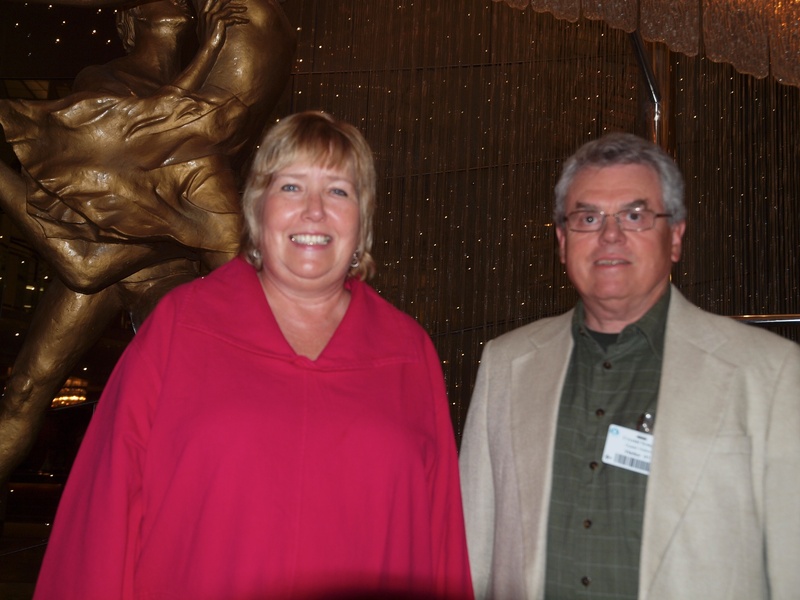 Jana Ebeling, from our Taos congregation, hosted us onboard a cruise liner in Juneau. Our first evening in town we dined with Jana Ebeling, from the Taos church, on her cruise ship. Jana gave us a tour of the elegant and enormous cruise ships we had been seeing all over Alaska followed by a wonderful dinner. What a treat, one we never expected to have. 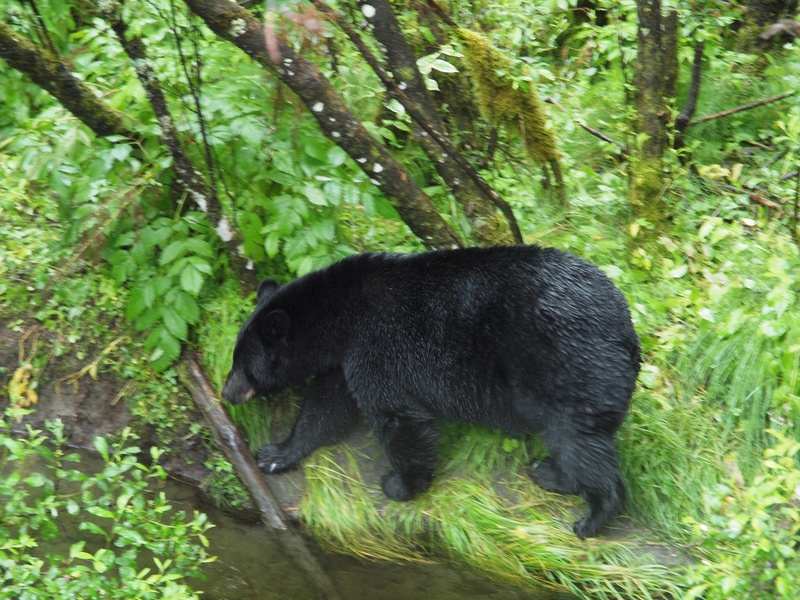 Black bears at the Mendenhall glacier were fattening up on spawning Sockeye salmon. Wayne really fell for glaciers. The Mendenhall glacier was just a few minutes from where we were staying and was set up for wildlife viewing. The black bears were very active feeding off the sockeye salmon that were spawning there. We watched one of them “fishing” below us, and another–a cub–up in a nearby tree. We hiked some splendid, though soggy, trails through lush rainforest and did some combing and eagle watching along the beach. We also took a charter boat one day to see the fjord at Tracy Arm. 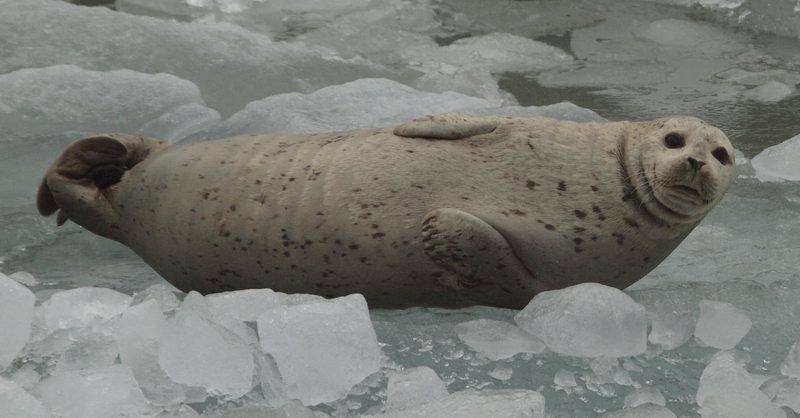 The glacier was spectacular and our captain took us right up to the ice, huge chunks of which were floating all around us, occupied by hundreds of loafing harbor seals. Our ship captain took us right up to the glacier at Tracy Arm. It was a beautiful week, if you could keep from getting discouraged by the rain (with an upbeat spirit southeast Alaskans call it “liquid sunshine”) but we were glad to get back to Seattle and a bit more summer (a strange thing to say of Seattle–some things are relative). Soon after finding the end of the road near Juneau we flew back to Seattle for time with family.